A 40,000-year-old race of snake people resurface, and with help of Serpentor, Desto, Baroness and Dr. Mindbender, plan to eliminate all of mankind and rebuild Cobrala. Once rulers of Earth, the Snake people were driven underground by ice-age temperatures. While in exile, they developed a plant whose spores turn ordinary men into mindless, weak animals. The key to their plan is G.I. Joe's secret project--the Broadcast Energy Emitter. Only this device generates enough heat so that the spores can mature. Humankind's very existance depends on G.I. Joe, but are they strong enough, smart enough, cunning enough to fight a warrior race with 40,000 years of experience? Another Piece of 80's History. YO JOE!!!!! Plot synopses: GI Joe (America's top military force) battles against Cobra (evil terrorist organization trying to take over the world). It this particular movie, the Joes try to stop Cobra from devolving the world through these organic spores. In this movie the true ancient origins of Cobra(la) are FINALLY revealed. 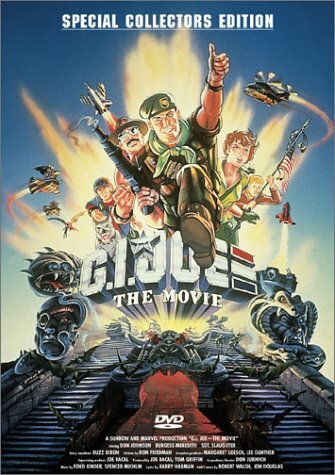 The movie marked a landmark in GI Joe storylines. (Personally, I thought it was sorta the beginning of the end...) Most the old-time favorite Joes and Cobras appeared. Many new characters also made their debut (Lt. Falcon, the Renegades, Nemesis Enforcer, etc). However, the movie itself, in my opinion is NOT the best feature of this DVD. The exclusive DVD features are!!! Exclusive DVD features: TWENTY-FIVE (25) ORIGINAL G.I. JOE PUBLIC SERVICE ANNOUNCEMENTS (you know, those "knowing is half the battle" things they aired at the end of each episode for the kids!!!) Two (2) movie trailers. Two (2) vintage action figure commercials (too waaay back even for me. Can't believe how cheesy those back in the day commercials were). A shameless plug for VHS tapes of G.I. Joe and Transformer cartoons. The DVD extras truly make this a "Collector's edition." DEFINITELY a piece of 80's nostalgia. Those PSA's RULED!!! GREAT: The DVD features especially those PSA's. "Knowing is half the battle!!!" Good: The action, soundtrack and animation. They sure don't make kids cartoons like this anymore!!!! Bad: Those cheesy vintage action figure commercials. The shameless plug. DEFINITELY a collector's item for any G.I. Joe or 80's cartoon fan. Recommended viewing for anyone who never grew up watching these but who are indeed fans of good animation. I remember watching the movie (or rather mini-series) on the USA Network before walking to my bus stop at 7:30am in a 5-part miniseries or something, hosted by Sgt. Slaughter. Great fun. Good voice acting, fun action. Amusing to watch. I'm assuming you've read the Amazon.com description so I won't go over anything you already know. Not exactly how I remember it but still good. Of course kiddy-ized in some parts but overall, not too bad. "Good news, Duke's come out of his coma!" Oh boy. My only real gripe with the movie was the paltry love story between Jinx and Falcon, which was more a personal gripe than critical. The animation in it makes me wonder. At times it seems very clean, very well done while at others sloppy and haphazard almost. The included service annoucements are very amusing to watch, if not just reading the titles, "Dog bite" ; "Suffocation". Oh boy. The commercials, referred to as 'vintage' are all right if you can remember them. Just a nifty little addition. I know it was an 80's children's cartoons I decided to buy this DVD is my attempts to "recapture my childhood" and I wasn't disappointed! The movie itself was okay but the DVD extras are what make this a "must-keep" for me. It this particular movie, the Joes try to stop Cobra from deeolving the world through these organic spores. In this movie the true ancient origins of Cobra(la) are FINALLY revealed. Great animation, outstanding intro, sad plot. Very sad. The last of the "good quality" GI Joe animation productions. When I first saw the intro scene with that new Cobra/GI Joe song I was like, "Wow, this is gonna rock"! Then the assault on the Terrordrome was also sweet. Then a cool fight scene in the artic. Then it all began to go downhill the moment Cobra Commander said, "I know where we can find shelter." As a DVD though, it's pretty good. Enough extras (love those service clips) and such. Brilliant to get Burgess Meredith, who played the tragically martyred journalist Ernie Pyle in the original movie of the STORY OF G.I. JOE, to take the role of Globulus in this sequel made some 40 years later! Okay, it's not strictly a sequel, but talk about going over from the forces of light over to the dark side! No one does it better than Burgess Meredith, as he proved playing the Penguin in the 1960s TV series of BATMAN, and now here in the middle of this stylish movie cartoon. Some complain that the emotional tone of the movie is too different from the TV series we all grew up watching. On the other hand some of the exact same writers were employed on both, including Ron Friedman, who wrote "Revenge of the Cobra." I saw his movie (that he wrote) BROTHER BEAR and I'm looking forward to his next animated special, Disney's new one CHICKEN LITTLE. A great movie to remember when you were a kid ! Classic 1980's Nostalgia-I Love It! Too bad America can't do nothing this creative anymore. Japan could teach this young generation something!